Home » Concrete » Precast & Prestressed » Building Systems » Industrial Building Frames » Building an Industrial Building? Precast concrete beams, columns and stairs are the ideal solution for owners and builders who want to achieve open spans, fire resistance, energy savings and attractive design with one structural system. 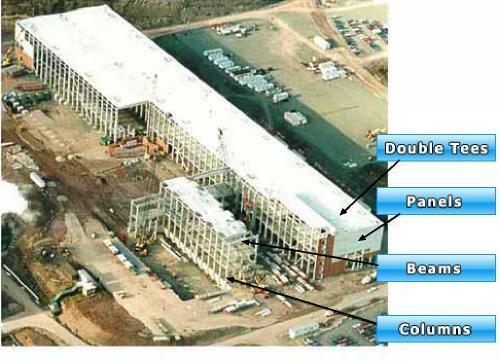 Precast beams may be either continuous with single story columns or single span beams with multi-story columns. The use of standardized forms accelerates the manufacturing process. These components are suitable for both low and highrise structures. Highly durable, these concrete units can be installed in all weather conditions. The quality of smooth formed finishes produces in a precast plant saves money by allowing designers to expose the structure in a finished building. Heavy loads and unusual wear conditions call for durable materials and special expertise. Strescon's products can be used for numerous industrial applications such as food processing, pulp & paper, mining, manufacturing and warehousing. Our Experienced engineering and detailing staff is available for value engineering and constructability reviews of your proposal. We will assist you in determining the most efficient and cost-effective designs.